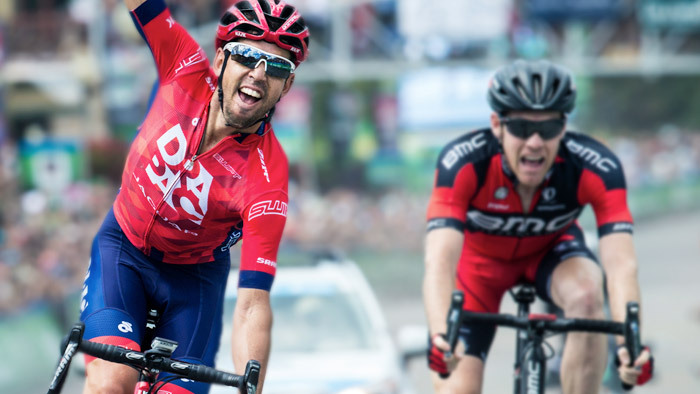 Just one week after finishing the Tour of Utah, Team Drapac will be one of 16 teams lining up at the start of the USA Pro Challenge, a seven day stage race through Colorado. For a team based in Australia, the obstacles are many. Travel, terrain, and altitude are all factors they have to overcome. How does a top level team get ready for two difficult week-long stage races when faced with these challenges? Before each race, the team sat down to discuss which riders to select. This process started well before the stages are announced. “Firstly, we assess the expected demands of the race,” says Drapac Team Performance Director Keith Flory. “When we draw up the initial long list of riders, it’s based on our knowledge of the races from previous years – both from first hand experience of being at the race but also some additional research.” After the route was announced, Flory and his staff refined their selections to make the teams that would contest each race. Much of this entails breaking the race down. “For a race like Utah, we know it will contain a heavy component of climbing and obviously at some fairly extreme altitudes and potentially climatic extremes too (heat). Based on this, we’re looking at a core group of riders who can sustain high powers for extended period of times to cope with the long climbs.” Flory explained. Going a step further, the team looked to specifically target stages with shorter, punchier climbs- which requires a different type of rider. “The power profile of riders who were in the frame for these stages was different. Higher power production in the 30 second to 2 minute ranges. Often, Flory is not with the riders. The team only races in Australia for the first six weeks of the season, then they race at events around the world. Of course, he stays in touch with his athletes throughout the year. “Obviously TrainingPeaks gives us such incredible insight into the rider’s training and racing performance. This is our first port of call re: communication. After that it’s ‘traditional’ communication techniques, albeit via modern technologies like Skype,” he says. Prior to beginning their preparation for these two races, the team had a 6 week mid-season break. The riders selected for Tour of Utah and Pro Challenge then did a solid training camp in the US at altitude to prepare. Though together as a team, the riders training is individually tailored. “Each rider has had a different season to that point, so to fit them into one training ‘box’ wouldn’t have been appropriate. Then we’re also looking at each individual and their respective role and goal in each of the stages.” Flory says. That push will continue as the riders of Team Drapac ride through the mountains of Colorado. Throughout the USA Pro Challenge, TrainingPeaks will showcasing power files from team riders to give you a closer look at the effort and energy needed to finish one of the hardest races in the US.